Nice 3 bedroom 2 bath house. Open floor plan with 1350 square feet. 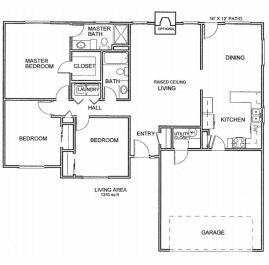 One bathroom is in the master bedroom and also it has a walk-in closet. 6 ft privacy fence great for a pet. 2 car garage and washer and dryer included. This rental is located and 1.64 miles from University of Missouri-Columbia. The property has a Walkscore of 15, so you will probably be driving or taking public transportation most of the time.